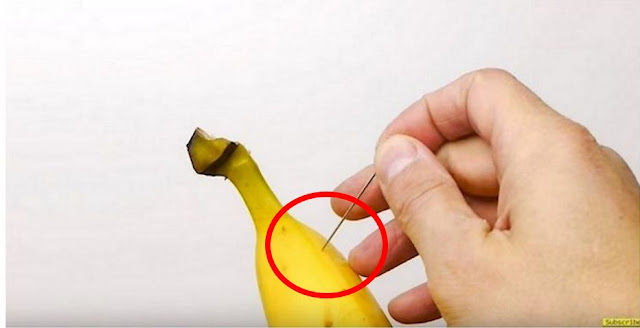 Home beauty creative dailythings Diet DIY Food hacks Health & Wellness Health and Wellness Interesting knowledge Nutritions recent relationship slider video Viral Section vs He Sticks A Sewing Needle In A Banana And Twists It Around. What It Does? This Is SO Smart! He Sticks A Sewing Needle In A Banana And Twists It Around. What It Does? This Is SO Smart! He Sticks A Sewing Needle In A Banana And Twists It Around. What It Does? This Is SO Smart! Bananas are such a versatile fruit. You can use them in baking, smoothies, ice creams, or just peel them and eat them raw. They’re high in vitamins and potassium and even babies can eat them. The good folks at Chiquita weren’t too far off when they claimed that bananas are quite possibly the perfect food — they’re even kind of perfectly shaped to fit just right in your hand! It’s like we were meant to eat them! Peeling a banana isn’t usually a particularly exciting process, though. You dig your nails in, pull the skin off, and hope it’s not bruised inside. Pretty lame, right? If you want to add some excitement to your life the next time you peel the banana, try this little trick and amaze your friends with a pre-sliced unpeeled banana. This video will show you exactly how to cleverly slice your banana from the outside without peeling it. It’s a great way to trick and entertain your friends, and it’s also a convenient way to take a sliced banana on the go without worrying about the fruit going brown! Step 1: Start by taking a banana and finding one of the angled ridges on it. It’s the line that runs from the tip to tip of the fruit. Step 2: Take a needle or pin and poke a hole into the banana, but don’t push it all the way throughout to the other side. Step 3: Push the pin back and forth inside the banana (this action slices the soft fruit inside). Step 4: Repeat step 3 but poke the next hole in about 3/4 of an inch below the first one for perfect bite-sized banana bites. Step 5: Do this down the entire length of the banana. The holes will be slightly visible, so when you show your pals be sure to hide the side of the banana that has the holes on it. Step 6: Peel the banana as you normally would and watch as your friends are blown away by your pre-sliced banana.